The SPK-1 two channel, speaker level A-B switch from Niles can be used to switch ampliﬁers, speakers, surround sound systems, or any application where a voltage-activated speaker-level switch is preferred. Applying 12 volts DC to the control input connector activates the switch. A control output connector is also provided. The control output is internally connected in parallel with the SPK-1’s control input. The control output can be used to control additional SPK-1’s by “daisy-chaining” the control output of one unit to the control input of the next. Connecting two SPK-1’s together enables you to switch four channels of speaker-level signals and connecting three units together lets you switch six channels, and so on. A maximum of 6 SPK-1’s may be connected together in this manner. 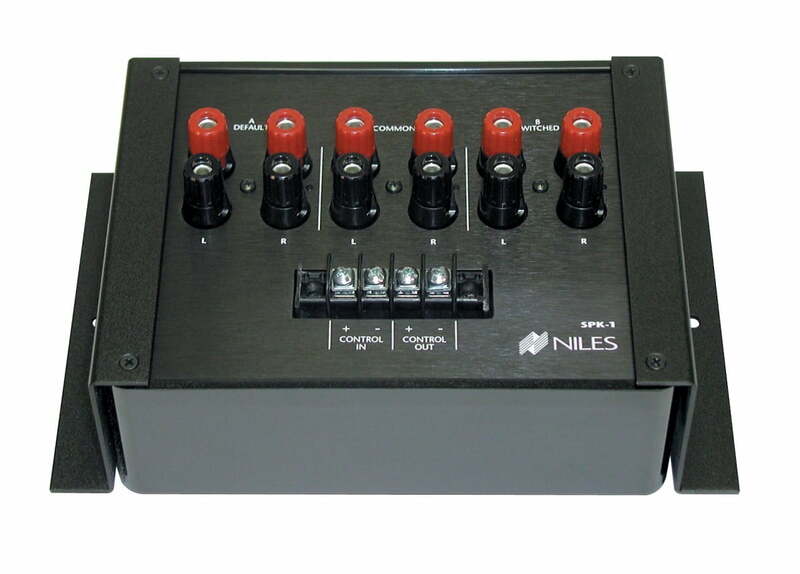 The control output can also be used to connect other Niles switching devices such as the AC-3 Voltage Activated AC outlet and the AVS-2 Voltage Activated Line-Level Switch.